Gallia e Peter’s history starts more than 100 years ago, in 1904 with my great-parents, Angela and Filippo Gallia. They started their millinery and hat shop in Turin and they were the royal vendor. At the end of the 20’s their daughter Mariuccia marries the son of the famous Milanese milliner Cornelia Peter and they move to Milan. 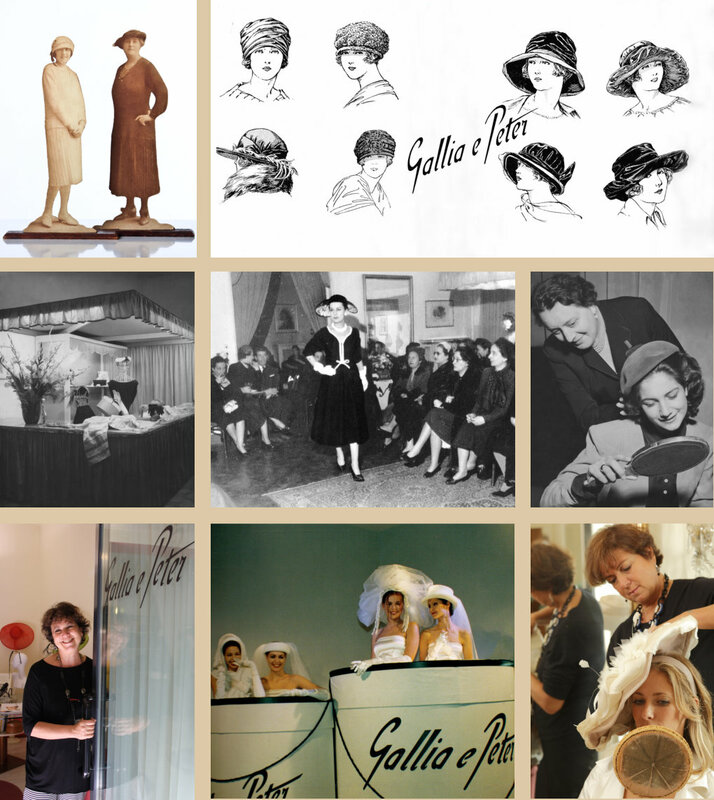 In 1930 they found “Gallia e Peter ” millinery in Via Montenapoleone 3. My grandmother Mariuccia kept creating hats even during the war. After the war, in 1953, she took part in the first hats fashion show at Palazzo Pitti in Firenze. Together with her friends Jole Veneziani, Biki, Wanda Roveda, Mila Schön, Gandini she became the milliner of “the well to do of Milan”. Year after year there were a lot of fashion shows in those beautiful halls with golden mirrors of the atelier in Via Montenapoleone. My grandmother Mariuccia passed her passion and her taste to my mother Lia and then to me. Growing up I saw the birth of hippy, punk and folk styles and the new generations of designers called Walter Albini, Giorgio Armani, Gianni Versace, Gianfranco Ferrè, Moschino and Gigli. These were the glorious 80’s and I started with them my enthusiastic collaborations that still today make my work full of innovation. In 2010, after almost 90 years in the historical headquarter in Via Montenapoleone 3, I moved Gallia e Peter in Via Moscova 60 where I make my knowledge of Milanese craft available with unchanged enthusiasm.